It’s something special when we own a pair of shoes that we actually prefer wearing over being barefoot in the comfort of our own home. We’re not talking about slippers, here. We mean a pair that we can wear out, too, that we’re actually proud to slip onto our feet and incorporate into our outfit. With warm weather quickly approaching, we can finally get back to wearing those shoes more often, and we found the absolute perfect pair for the season. We had to take a closer look at the Nike Benassi JDI Slides when we noticed a pattern in The Big Bang Theory actress Kaley Cuoco’s footwear. She is always wearing these slides, and we know she especially loves them because she owns multiple colors! Plus, she could obviously wear any shoe she wanted to, and she chose this one over and over again. We don’t need to be a sitcom star to afford and rock these comfy slides, just someone who loves them! See it: Get the Nike Benassi JDI Slide (originally up to $30) starting at just $20 at Zappos! Many reviews listed where everyone wears these Nikes, one calling them the “perfect airport shoes” because of how easy they are to slip off. Plus, when we’re standing in long security lines, we like to be comfortable. Another theme among the reviews is how these slides are suitable for all ages, because they’re equally as cute as they are functional. These slides have an injected Phylon midsole and outsole for “superior comfort.” Phylon is an EVA foam, made of little pellets and sculpted to fit our feet flawlessly and provide cushioning. These shoes are just thick enough for more shock absorption and less leg and foot fatigue, but not distractingly thick. These are no platform shoes that will send us flying if we try to actually walk in them. One shopper even said they can jog in theirs! These shoes have a leather-look upper strap with a Nike logo on top, featuring the iconic swoosh we all know and love. The strap is nice and wide, featuring padding on its underside so our feet will stay in place and we won’t have any thin straps or hard buckles digging into our skin. Cuoco has styled her JDI Slides in a few different ways She was once spotted wearing a bright pink version with an athleisure-chic outfit, featuring yoga pants and a pastel, long sleeve zip top. Another time, she stepped out in her black slides, wearing adorable black leggings patterned with neon red hearts. She kept things comfortable, wearing a long tee on top and a sweater draped around her shoulders. Yet another time, she kept it super casual with her black slides in LA, wearing a V-neck graphic dog tee and oversized athletic shorts, accessorizing with a wide brim hat and a S’well water bottle in hand. These slides are currently available in eight versions, featuring different colors and differently-patterned uppers! There are a few different black versions, two of which feature pink logos. One, however, has a diagonally-striped upper while the other keeps it smooth and simple. The other black slide has a white logo with a small weaved pattern on the upper, with different finishes of black climbing under and over each other. There is also an all-white version of this shoe with a silver logo! If we want a little more shine, we can choose the pair with the shiny olive-gold upper, or the silver Wolf Grey pair. For something more muted, the Phantom/Crimson Tint pair keeps things very neutral, as does the Particle Rose shade, which is a light purple-pink color. Not your style? 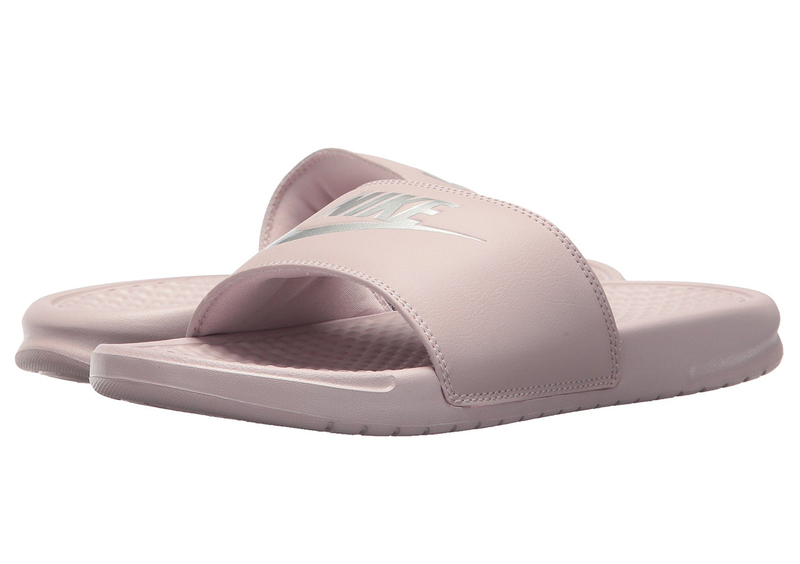 Check out more from Nike here and other sandals available at Zappos here!